Its been one of those crazy days following an equally crazy busy spring break! To tell you the truth, when the spring break started, was kind of dreading it and wondering what I am going to do with my little one for 10 whole days. But the days just whizzed past full of activities and fun, get-togethers, picnics, a visit to the Barclay's Center to watch a basket ball match, a day devoted to exploring and learning science at the Liberty Science Center and so on and so forth! Today kind of topped it all - a major grocery trip took up most of my morning. Add to that the usual chores and workout as well as kiddo's school and extra curricular activities - all in a day's work. But the cherry on the top - some problem with the water supply left us with no water to cook! The repair was done by evening, but the day was beautiful. I mean, after all these months cooped up due to the cold weather, no way was I giving up the chance to let myself and the little one soak up some much needed Vitamin - D with the unusually warm temperature. Finally, was left with 30 minutes to prepare dinner - 30 minutes when I was already tired, hungry - exhausted! The pressure cooker took care of rice and a simple dal tadka. Fortunately, I had prepared sufficient chapathi dough for the night when I packed my son's lunch in the morning. For the side dish, I opted for Tofu Bhurji. Wait - don't react to the name. Just try it once - I assure you, it is as good as egg bhurji and paneer bhurji. Infact, if you don't like the smell of egg, this is perfect. No egg smell, yet the wonderful bhurji taste! The best part? Bare minimal vegetable cutting and a quick fix dish! Heat oil and add the cumin seeds. When the cumin seeds start crackling, add the white part of the scallions along with the ginger garlic paste. When the scallions turn a golden brown, add in the tomatoes, capsicum, turmeric powder, salt, coriander powder, cumin powder and red chilli powder. Let these cook for about 5 minutes. Now break the tofu and add it. 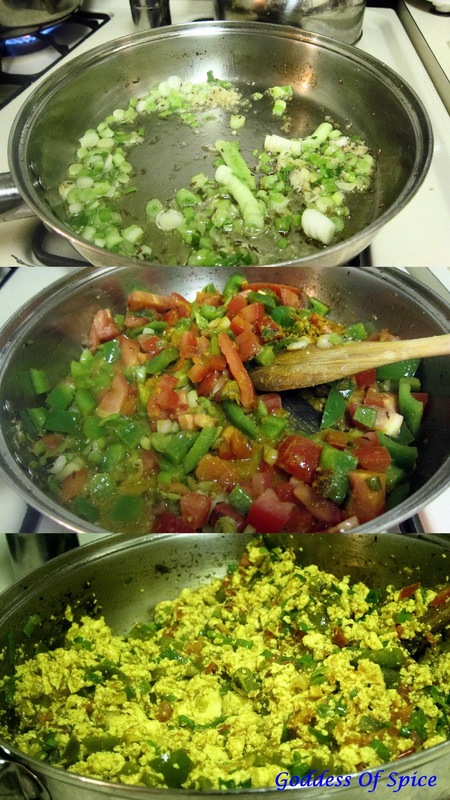 Add the sabzi masala and cook stirring constantly till all the moisture from the tofu evaporates about 4-5 minutes. Garnish with the green parts of the scallion and serve hot with phulkas. That looks so yum Priya. I make Tofu Bhurji. But just an onion, tomato and green chilli version. Your's sound delish! Love tofu...have to try it, Priya!! Recipes.in is a search engine that compiles the best Indian cooking sites and blogs from the Internet. We are the second largest in the world with sites in 37 markets and several hundred blogs are already enrolled here and benefit from the traffic we are sending to their sites.